South and North Korean players of Team Peace, in white, and Team Prosperity play during a friendly basketball game at Ryugyong Jong Ju Yong Gymnasium in Pyongyang, North Korea, Wednesday, July 4, 2018. The rival Koreas on Wednesday began two days of friendly basketball games in Pyongyang in their latest goodwill gesture amid a diplomatic push to resolve the nuclear standoff with North Korea. 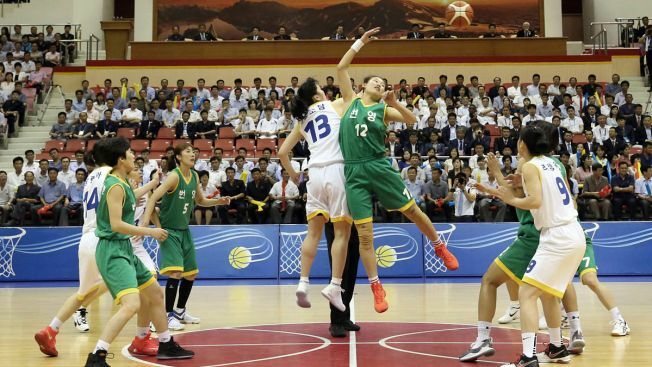 The rival Koreas on Wednesday began two days of friendly basketball games in Pyongyang in their latest goodwill gesture amid a diplomatic push to resolve the nuclear standoff with North Korea. Players from North and South Korea were mixed into two teams that competed against each other at the North Korean capital's Ryugyong Jong Ju Yong Gymnasium. A capacity crowd of 12,000 at the arena applauded as the two women's teams — dressed in white jerseys that read "Peace" and green jerseys that read "Prosperity" — marched onto the court holding hands. Team Prosperity defeated Team Peace 103-102, with North Korea's Ro Suk Yong scoring 18 points, according to pool reports. The game between the men's mixed teams that followed ended in a 102-102 tie. The South Koreans will play against the North Korean men's and women's teams on Thursday before returning home on Friday. The games precede a visit to North Korea by U.S. Secretary of State Mike Pompeo for meetings over the future of the North's nuclear program. North Korean leader Kim Jong Un, a noted basketball fan, didn't appear at the gymnasium on Wednesday. It wasn't clear whether he would attend on Thursday. "Once they started playing, the players showed quick chemistry and I was proud of them," said Lee Moon-kyu, the head coach of South Korea's women's team, who will also lead a combined Koreas team at the Asian Games next month in Indonesia. Lee, who plans to bring two or three North Korean players to the Asian Games, said he was impressed with "No. 9 and No. 7 on Team Peace," referring to North Korea's Ri Jong Ok and Jang Mi Kyong. North Korea's sports minister, Kim Il Guk, said in a speech that the games reflect the "revered determination of the leaders of the North and South to bring forward the future of a self-reliant unification." The South Korean delegation, including 50 players and government officials, arrived in Pyongyang on Tuesday on two military aircrafts. "It feels like the first time I came here all over again," said Hur Jae, head coach of South Korea's men's national team, who previously visited Pyongyang for a joint game in 2003. Hur, a former guard whose two sons are among the players who traveled to the North, talked about his friendship with retired North Korean player Ri Myong Hun, a 7-foot-9 (2.35-meter) center who anchored the country's national team during the 1990s and early 2000s. "There was a buzz when I shared a glass of soju and talked with Ri Myong Hun in 2003," Hur said. Ri did not attend a dinner reception for South Korean players on Tuesday, and it wasn't immediately clear whether he was at the games on Wednesday. The exchanges are the latest result of a diplomatic outreach to the South that Kim announced during his annual New Year's speech. That led to the North's participation in the Pyeongchang Winter Olympics in February and two summits between Kim and South Korean President Moon Jae-in. Kim has also met with China's President Xi Jinping and U.S. President Donald Trump. 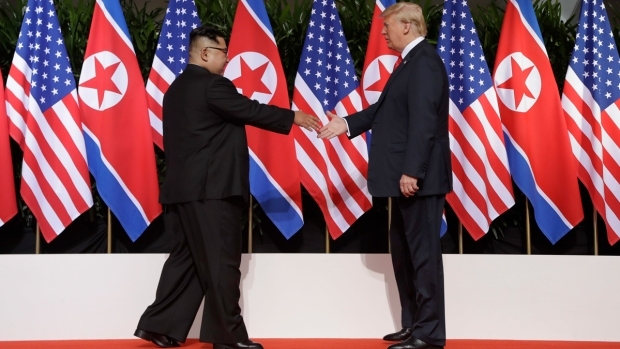 The inter-Korean summits have facilitated a slew of goodwill gestures between the Koreas, which have also agreed to field combined teams at the Asian Games. Basketball diplomacy has something of a history in North Korea. Former NBA player Dennis Rodman arranged a game in Pyongyang in 2014 for Kim's birthday. South Korea's Hyundai business group built a basketball stadium in Pyongyang during a previous era of rapprochement between North and South Korea, and a joint game was played there in 2003. Two rounds of inter-Korean basketball games were also played in 1999. The Former NBA star has said he's helped bring awareness about North Korea to the world.